It’s Labor Day weekend, the unofficial end of summer, and I am home instead of up North. I should be there, we should be there; there is work to be done, boats to be pulled out of the water, and a dock to be pulled out, too and so many more chores – summer is over and winter is coming. We planned to be there but it didn’t happen. We didn’t leave. Usually, for labor Day weekend we leave Friday evening and come back Monday afternoon. But, with W’s football schedule we’d planned to leave Saturday after his practice session. That meant we could take in the varsity game Friday night; it was a big game against the defending state champion who had beaten us the past two years in a row. Last week was the first full week of school; it was exhausting – mentally, physically, and emotionally. I was drained and with one look in W’s eyes, I could see it had been a long week for him, too. Going back to school (or work) after a vacation is difficult but the weather changed to make it even worse. The week began with a heat wave and ended with a spectacular storm Friday night. If it hadn’t been for the storm, I’d be sitting at the table and looking out at the lake, instead I am home sitting at the dining room looking out at the neighborhood. Despite the heat, it was a good week. My students are getting acclimated to being back at school and really thinking. I can only imagine how tired they were on Friday afternoon, because I was. For the first few days of school I allowed them to choose their seats, some chose well and others did not. That’s sort of how it goes, in school and in life but, by Tuesday, I had created a seating chart and shuffled the kids around the room. It still needs tweaking, but I’ll work it out next week. At the beginning of the year, I work hard to remember EVERY student’s name – first name and last. It’s daunting with a couple of Emmas, a few Zachs, and a few names that sound similar, but aren’t. Even with similar names, every kid is different and I work very hard to remember who they are. This year, I have 85 students in my two English Language Arts and one geography class. On the first day, I told them my goal was to know ALL of their names by Friday and I did it. I also told them I EXPECTED them to know everyone in the class by the end of the first quarter. I could see several of them looking around the room mentally checking off whom they knew and whom they didn’t. Just as I have learned my student’s names and I am working on the daily classroom routine, at home we are slowly returning to a schedule, a routine, or normal. High school starts at 7.20, middle school at 8.00, and elementary at 9.15. It all has to do with the buses and other schedules. It’s the same in my school district and I have to be at school by 7.30. My drive to school takes me right past W’s school and last year he started riding along. It’s a nice routine – I get him up, get him breakfast, and drop him off. I also pick him up on my way home. It’s a fair trade. The return to school also means sports and other activities restart, especially high school football and Friday Night Lights. This year W is a sophomore and the sophomore team plays Friday night before the varsity game. Friday night high school football is a big deal for our family. B played in her high school band and never missed a game and I played as a sophomore and never missed watching a home game either. 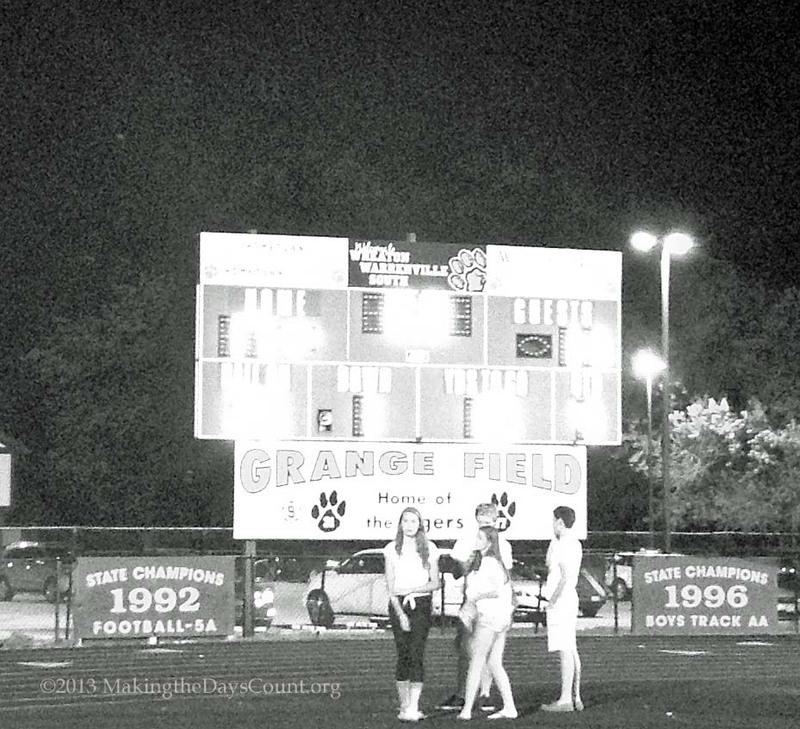 I can’t remember missing a Tiger home football game, it has been that long. By Friday, we were all pretty excited. It was a hot day and the weather folks had forecast strong storms for game time. I checked the radar the storms were ‘blowing up’ north of us and in southern Wisconsin right along the border and it looked like the storms would miss us. W’s game started at 5 PM and it was hot. We could see the storm clouds to the north. After the first quarter, the Tigers were down 0-2 but they gained the lead with a long run for a score and lead 6-2 with a few minutes remaining in the half. That is when everything went wild. We could hear thunder in the distance, but we had sunlight, then suddenly a flash of lightning and the game was suspended. The teams headed indoors to the field house and the rest of us evacuated to the school. The wind picked up, the temperature dropped and I snapped a few shots of the clouds as I followed the crowd off the field. Once inside, we all could sense the weather had changed dramatically. It was dark and the rain came down. For our safety, we were asked to stay away from the windows, never a good sign. I stuck close to B and O and we listened for news – when we would be allowed to return to the stands and restart the game. No news, just rumors – sophomore game rescheduled for Saturday, hoping to start varsity game on time and after an hour or what seemed forever, we decided to leave and go home and wait there. We don’t live far, only five minutes away, besides we could pack for our trip up North on Saturday afternoon. Ivy greeted us at the door looking worried, she doesn’t like storms. Nervously, she followed us around the house. B packed, O packed, and I threw shorts, shirts, swim trunks in my bag and packed my dopp kit and then, bam – the power flickered and then went out. I had been following the news on Twitter and read the reports from across the area about the storm. 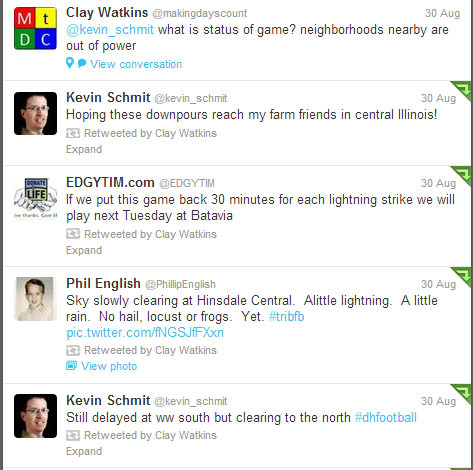 From what I read, many of the local of the games had been postponed. Some of the tweets were funny…. About 8.15 the game was officially postponed and W called for a pickup. By that time, it was dark, the rain had passed but the lightning was very visible. He told us his game was scheduled for 11, after the freshman game at 9 AM. They only had a half to play so that meant we’d be on the road by 1 PM. We were still on schedule, sort of. Saturday morning arrived and so did more rain. When I dropped W off at school it was sprinkling, I could hear thunder in the distance and then the downpour began. W texted that they had postponed the game until Monday and we could pick him up. This is when everything began to unravel, W was upset and wanted to stay. I wanted to get moving and get to the cottage. We had work to do, stuff to get done. I figured if we worked hard, we could get all of the work done by Sunday afternoon and come home late Sunday night and W could play in the game Monday. We packed the car, but the debate continued. The debate centered around W’s workload – homework load and stress level. We even pulled out of the driveway before we chose to stay home and decided I would drive up next weekend and get some help with the boats and the dock. Everything else I can do by myself. We unpacked the car and I took a nap. It wasn’t hard for me to fall asleep, I was pretty spent and W took a nap, too. Staying home meant we could even take in the varsity game Saturday night. The Tigers have a tough schedule beginning the year against the defending state champion, game two against a perennial state power, and week 3 with crosstown rival Wheaton North. In 2012, the Tigers lost to all three of these teams 012 and fell to two other teams to finish 4-5 and miss the playoffs for the first time since 2002. At Wednesday night’s fall sports meeting, the head coach said expectations were high leading into the season, as they always are. Even though W doesn’t play on the varsity, he’s still a Tiger and our expectations are that W will play hard and learn that sometimes you win and sometimes you lose, but you always work hard and play hard as if every play, every moment counted. It was a good game and early on it looked like the Tigers would start the year with a loss, but they played hard, made some good plays and upset the Hilltoppers 17-14. Winning, it’s a great way to start the season, a great way to start the year, but there are eight more games, and many more ways to make the season count. For me summer will last one more week – I have a date with lake and a couple of boats next weekend. For now, I’d better jump up, jump in and seize the day, today is gonna be a great day, possibly the best day ever. Making the Days Count, one day at a time even when I’d rather be looking at a lake. When was the last time your plans changed at the last minute? Did it work out? Ouch! Here in Europe the schools have only been back one or two days at most. It sounds as if Labor Day comes just when it’s needed. An upcoming weekend at the lake sounds like a great incentive to make this week count. Have a great one! Coleen – It’s been a good week so far… teacher meetings on Tuesday, then regular classes with kids today and the rest of the week…and I remembered 90% of their names after a four day weekend – wootwoot! Looking forward to getting the boats out and stuff put away for the winter. Enjoy the long Labor Day weekend! Sounds like you had a great summer Clay! Thanks Phil – it was a great summer, now it’s time to pay the piper and get back to work! Just dropped W off for the last second of the first half of Friday’s sophomore game…. Go Tigers!